The 2011 split results revealed, and ranked! It wasn’t until July last year that the split results were released, so to wake up this morning and see that the EBU had made them public just a fortnight after the contest was a great surprise! 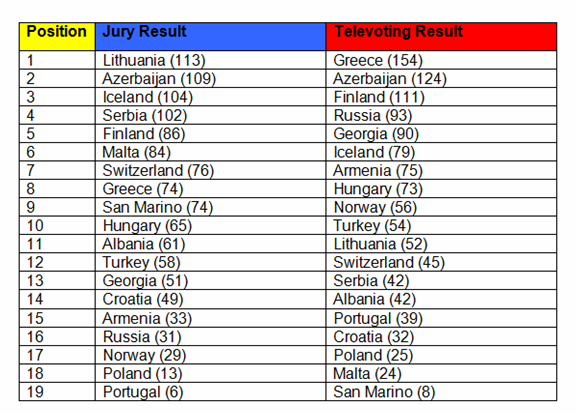 I’m wondering if you’ll be as shocked as I was by some of the entries that both the juries and televoters decided were worthy of their highest points…here’s a brief look at the final stats as seen above. 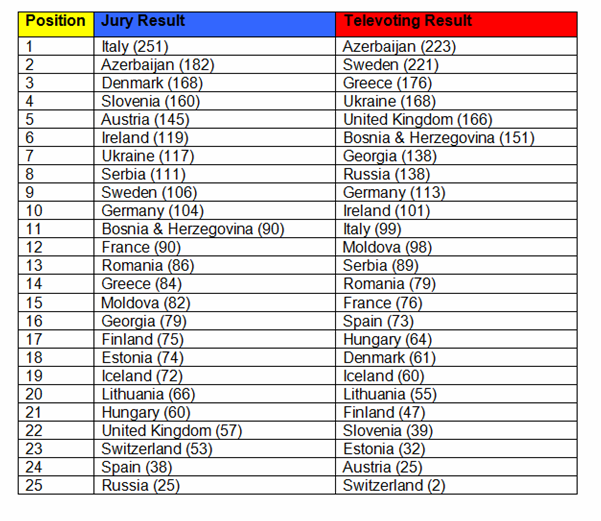 If the outcome of Eurovision was still decided by 100% televoting (as it was up until a few years ago), this year’s top 10 would have consisted of Azerbaijan, Sweden, Greece, Ukraine, UK, Bosnia & Herzegovina, Georgia, Russia, Germany, and Ireland. So not too different country-wise, but quite different position-wise! And in a fantasy land (not mine) where Eurovision is decided by the pros alone, Italy would have won, followed by Azerbaijan, Denmark, Slovenia, Austria, Ireland, Ukraine, Serbia, Sweden and Germany. That means the J’s and TV’s have just 50% of their top 10’s in common. Azerbaijan and Sweden were very close with the fans, with just 2 point separating them. The UK might take some comfort in the love they got from the televoters – all 166 points worth – despite the fact that the juries didn’t rate them. Fan favourite Denmark shockingly owe the juries their 5th place – not the televoters, who pushed them down to 18th! The countries on the most equal footing are Lithuania, Iceland, Romania, Germany and Azerbaijan, who attracted a similar amount of attention from both sides. The juries got 80% of the qualifiers they wanted; the televoters got 70%. You can see two very different winners from each group…both more than a bit stereotypical! The juries lavished the love on Lithuania, a grand, old-fashioned ballad belted out with gusto (and a bit of sign language, which was a nice touch, albeit stolen from Latvia’s 2005 performance) whereas the televoters couldn’t get enough of Greece’s ethnic-modern fusion (and perhaps their absurdly attractive singer). Also expected is the popularity of Norway with the TV’s in comparision to its rear-end-of-the-scoreboard relegation with the J’s. 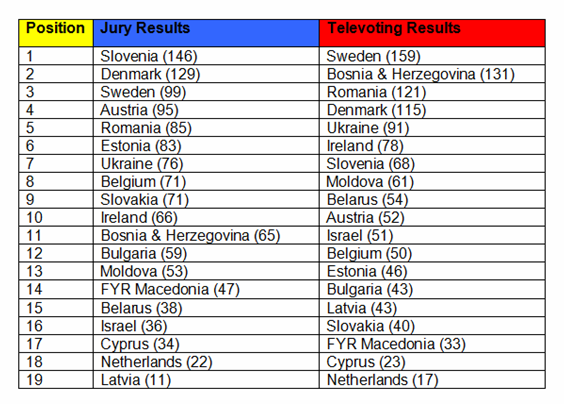 Here, the juries, got 80% again, whereas the televoters got 90%. It seems the compromise is working out fair! Once again, we can see two very different, but not surprising semi winners. The powerhouse vocals of Maja from Slovenia won out with the pros, whilst the Popular powerhouse performance/party anthem of Sweden got the TV’s dialling. The viewers shared Anastasia Vinnikova’s love for Belarus, it seems. What do you think of the split results? Were you shocked or surprised, or did you expect what you saw? Let me know down below! Posted on May 26, 2011, in Eurovision 2011 and tagged best, Blue, contest, Dusseldorf, Eric Saade, Europe, Eurovision, Eurovision 2010, Eurovision 2011, Eurovision winners, fans, final, jury, music, news, Norway, performances, pop music, results, Russia, singing, songs, split results, Sweden, televoting, top ten, Ukraine, winning, worst. Bookmark the permalink. Leave a comment.